The Work-Shy asks, How might a poem listen? What would it hear? The anonymous poets, activists, and scholars of the Blunt Research Group (BRG) have produced a stunning collection of poems gathered from the text of case files from California’s “orphan asylums” and youth prisons of the early to mid-twentieth century. The introduction to the collection sets up the grim context for these files: their contents were often used to recommend these young people for forced sterilization. A center of U.S. eugenics efforts, California’s sterilization “mills” proved a model for the definitions and practices used by Nazi Germany. As the BRG writers share in the background information to the collection, their poetic work counters the institutionalized end of the individuals’ lines, and instead offers to hear their stories as deserving to continue into present and future productions. This found poetry repeats back the muffled stories of these young people and explores what restorative justice inhabits their spaces, letters, and words. The Work-Shy creates an alternative approach to these brutal archives. Each page-long poem, named for its speaker/subject, gives shape to an individual whose information was recorded only so far as it provided evidence for their degeneracy and the consequent erasure of their reproductive rights. The jaded, even sarcastic tone of the field notes on these “ungovernable” teens clashes poignantly with the few, if any, words left from the teens themselves. Of various lengths and structures, the poems sometimes surround a name like a constellation and other times run in orderly rows beneath the greyed “JULES” or “EMILIO” hovering at the corner of a page. Clinical portraits, art made by the wards, and a eugenics genealogical chart interrupt the progression of poems and prevent a slide into poetic detachment that evacuates the humans from the narrative. The BRG’s sparse poems highlight the gross insufficiency of these files whose primary purpose is to reduce a person into a dead-end branch on their family tree. The constructed form of poems in the first section, Lost Privilege Company, emphasizes their patchwork, polyvocal nature and establishes the presence of the institution. The poems distinguish the words collected from the writing of the wards and that of the caseworkers with italics and quotations. Their disjointed style reminds readers that these are overheard moments and interrupted stories, not representations of a whole person and thus avoids the reduction of these individuals into trite portraiture. Instead, the considerable white space on the page belies the powerful acts of erasure imposed on these young people and reminds readers to listen for what is missing in the archives. The second section, The Book of Listening, lingers in the position of the poets themselves. The speakers ask how they might be listeners of an archive and negotiate questions of constraint and consent from someone they will never meet and who can never grant permission. Text from the asylum residents’ writing alone forms the poetry in the final section, Creedmoreblanca. Yet, the BRG’s presence is felt throughout in the translation from prose to free verse. Although this section lacks the unsettling juxtapositions created by Lost Privilege Company’s many voices, its stress on how each person ‘sounds’ develops questions of how well a poem can both enact and enable listening. The BRG maintains the spelling, capitalization, and underlines of the original writers in the poems of the final section. This set proves most successful when the visual defies comprehension without the assistance of the auditory. Jules writes, for example, “that swye the prossy cuter / reely hazzit infamee”—the pauses of speech rather than spelling conventions separate each word, creating auditory sense to what appears nonsensical visually. I found myself speaking the poems aloud, almost removing my eyes from the text in order to listen to them with more distance from my habits of reading. Reminiscent of other archive-based poetry printed by Wesleyan University Press such as M. NourbeSe Philip’s Zong!, The Work-Shy demonstrates what Toni Morrison calls “re-membering” in that it gives shape to the embodied lives of people who have suffered the violence of oppression even in how they are written into/out of history. Given the disproportionate number of people in these asylums and prisons who are young people of color, this poetic re-membering represents a necessary response to history’s white noise. The poems enact a symbolic form of listening to those who were unheard during their lives through reading and writing against the grain of normative historical narratives. The focus on listening in these poems not only marks the considerable auditory presence of the poems, which often demand to be read aloud, but also signals listening’s connotations of an intentional effort to pay attention, a sense of dialogue or reciprocity, and a progression away from the vision-obsessed culture that has used skin color in particular as an excuse for exploitation and violence. The Work-Shy asks readers to pay attention. Sometimes clinical, sometimes whispered, sometimes hollered, it resonates beyond linear text. The BRG’s challenge to conventional ways of understanding history inspires questions, concern, and mourning for discontinued lines. 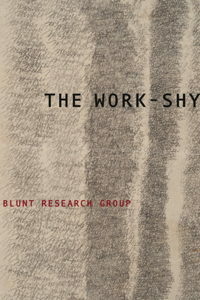 The Work-Shy exemplifies some of the most important work poetry can do—to create the space to notice those who have been disparaged, muted, and trapped. It is poetry that calls for new modes of listening to the world and for noticing those who are speaking but too often go unheard. Would that many more archives be listened to by poets ready to sound the darkness and offer such respect to each individual’s words and silences.